Please clean up after yourself and keep your room and bathroom clean and tidy (we have cleaning supplies you can use) Please do laundry (3/4 full) between 7pm and 7pm on weekdays and anytime on weekends Limit showers to 15~ minutes. Quiet time - 10pm~ (i go to bed around 8: 30 so try not to make too much noise: ) Let us know if it is too hot or cold inside and don’t open the windows when the heat or air conditioning are on. No overnight visitors (unless we say its ok) Let us know in advance if you are having a guest over. Please don't use strong perfumes or scents. We try to eat a lot of organic food and try to minimize toxins in cleaning products, laundry detergent, dish detergent etc. That contain chemicals. Please ask me before picking up or touching the baby. He is still really little and can't handle big germs. If you are sick please do your best to not spread germs. Ie wash your hands often. We hope these rules sound reasonable and make sense to you. (We will provide a more detailed list of info on our home when you arrive). Happy, health conscious, vegan, creative, mom, hoping to start running again. 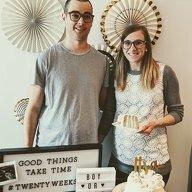 I am at home full-time unit Jan 2020 and my husband works full-time downtown.